It was nearly ten years since I had last cycled around all the parish churches in this area north of Bury St Edmunds, and I was very much looking forward to going back. Revisiting other areas of Suffolk, I found that more churches were open, or at least accessible, than had been on my last jaunt through the county. If you included those which listed a keyholder, it was now more than 90%. What would I find here? The area north of Bury is notorious for locked churches, and there is another blackspot near Lowestoft, which skews the statistics, although it does mean that churches virtually everywhere else are open. The day started well. In the late 1990s, I had found both Fornham St Martin and Culford locked without keyholders, but this is no longer the case. Approaching Ingham, I wondered if there had also been a softening of the heart here as well. This part of Suffolk is mostly wild and beautiful; but Ingham is not, I'm afraid. It stretches along the ugly A134, and, although it is pleasant enough away from this road, the heart of the village is destroyed by it. There is a lorry depot, a large petrol station, a dangerous junction. It is as ugly a stretch of road as you'll find anywhere in the west of the county. St Bartholomew sits on the road, but its screen of mature trees make a reasonable stab of absorbing the traffic noise. They tend to obscure the 15th century tower, which Mortlock politely hints was largely rebuilt to its original design in the 1860s, but once you get beyond them the graveyard is surprisingly wide and spacious. The chancel is obviously Victorian, but the whole piece works harmoniously together, and I like the redbrick arches to the nave windows. I tried the west doors, but they were locked. A cobweb stretched across the join between the two doors, and they didn't seem to have been opened in ages. On a ground nearby, a long-abandoned sign advertised a family fun day the previous July; eight months on, only the snails and insects seemed to be getting any use out of it. The flushwork behind where it had obviously leant against the wall was pitted and broken. I looked around and tried all the other doors, but they were all firmly locked, with no hint that anyone might consider it a Christian duty to provide hospitality towards strangers and pilgrims. Was the church still in use? I peeped through the window, and the interior appeared to have been gutted. The floor has been carpeted, and the pews replaced by garish orange chairs. Normally, I'm all in favour of modern seating, but here there seems to be no regard here for the integrity of the medieval structure. The interior seems entirely out of sympathy, as if a modern building was camping out temporarily in an older one. I wonder what it will look like in thirty years time? You couldn't help thinking that the congregation here would probably be better off in a new building, rather than trying to make a silk purse out of a beautiful sow's ear. Probably, they don't think of this building as a Church in the historic sense, of a devotional space for private meditation, and an opportunity to experience a sense of the numinous. Perhaps they didn't realise that it is a touchstone down the long Ingham generations. Perhaps they think of the building as no more than a venue for the activities of the Sunday worshippers. But that would be very wrong, I think. And it isn't even that this building is entirely devoid of interest, because there is medieval glass in the south porch, which has been converted into a utility room. Or, at least, there used to be. I wonder if it is still there? 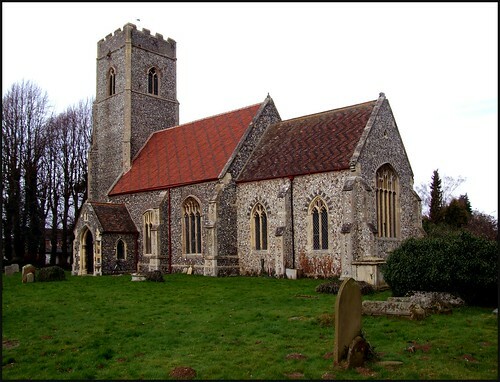 The history of this parish is an interesting one, connected as it is with the Cornwallises and Benyons of nearby Culford. The other churches in this area reflect this, so it is hard to think of spending much time hunting down a key here, when you could be off exploring Ampton, Timworth or Great Livermere; or, indeed, the wild, strange beauty of the forgotten church at Culford Heath, just a mile away.